One of the main reasons I visited Penang, and in particular George Town, is to take photos of the many murals and street art there. During my second day in Penang, I woke up early and hit the streets in the hope of taking shots of as many murals as possible. Even then, I did not manage to take all but at least I took some of the more famous ones. 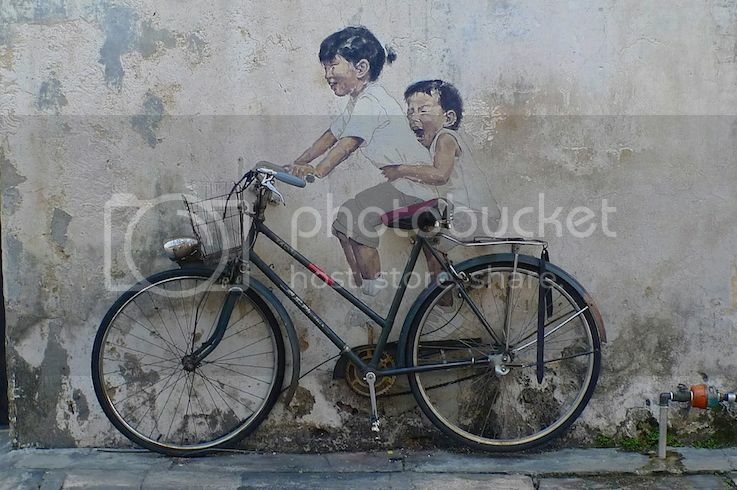 The first mural I took was this famous 'Little Children On A Bicycle'. It depicts a girl taking her younger brother on a bicycle ride. 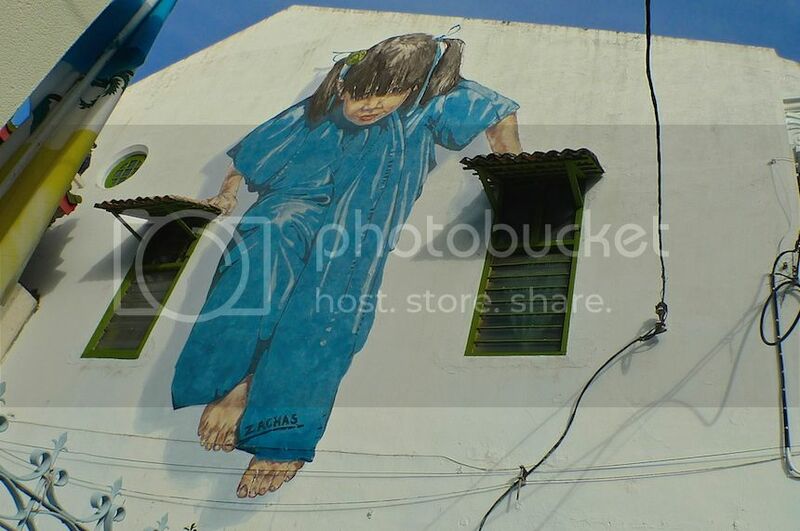 Located at Armenian Street, it was one of the many murals beautifully drawn in 2012 by Ernest Zacharevic, a Lithuania-born artist, as part of a street art project known as Mirrors George Town. A real unused bicycle had been strategically placed below the paintings making it a truly amazing work of art in 3D! Unfortunately, the mural became a victim of vandalism when a few months down the road, someone defaced the mural with a splash of yellow paint right above it. However, it was later discovered that the paint was actually wax. Two siblings, Tan Jia Han and Tan Jia Shin, volunteered to clean up the mess and they were rewarded for their selfless efforts by the Penang Tourist Centre. Read about it HERE. 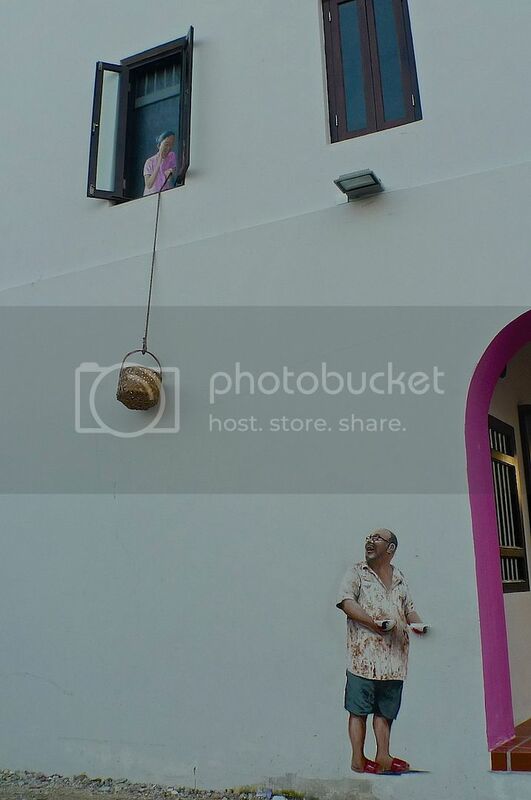 Next I visited two more Zacharevic's murals which were situated just next to each other at Ah Quee Street. On the left is a 'Little Boy With A Pet Dinosaur' and on the right is 'Boy On A Bike'. It's too bad that the pet dinosaur was no longer visible. I guess it must have faded with time. You can see the mural with the dinosaur still intact HERE. Now why would Zacharevic drew a dinosaur instead of a pet dog or something? I thought that was very creative of him! Vandalism had once again reared its ugly head when someone scratched on this mural with what appeared to be charcoal lines. What can I say? Malaysia is unfortunately, famous for vandalism! 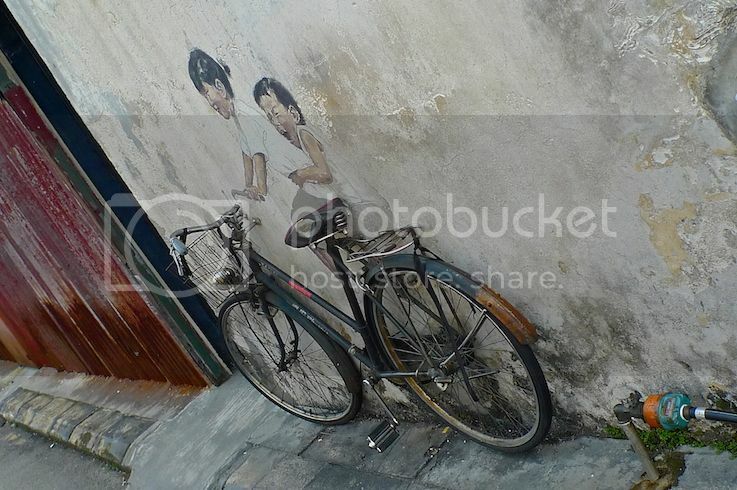 The boy on a bike was painted on the side door of a shophouse. The boy appears to be sitting on the motorbike and glancing at the pedestrian traffic behind him. Luckily, this mural was not vandalised. In fact, I was quite surprised that the disused bike which was placed there as a prop, had so far not gone missing! LOL! Another famous mural drawn by Ernest Zacharevic is this 'Reaching Up' mural located along Cannon Street. 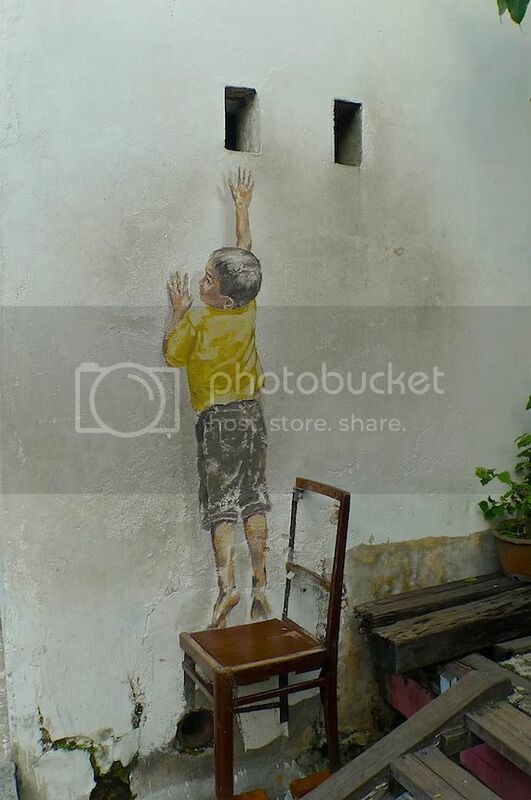 It depicts a boy standing on a chair and inching his way up to reach the hole in the wall. 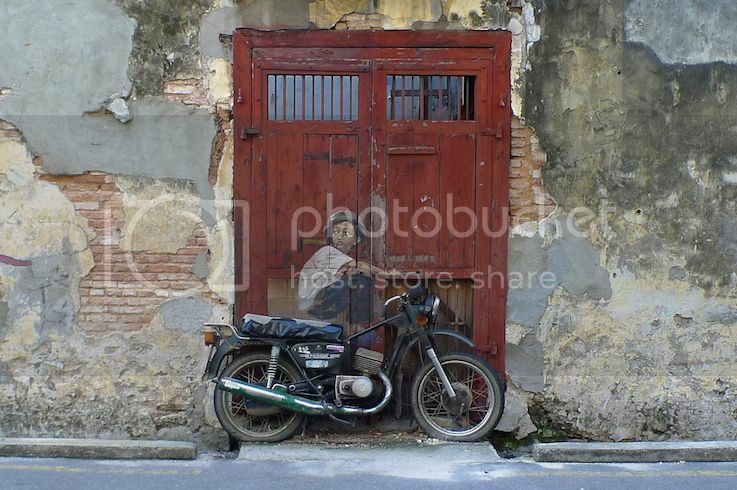 And just like the bicycle and the motorbike in the previous murals, the chair here is real. By the way, did you notice the boy has shadows? 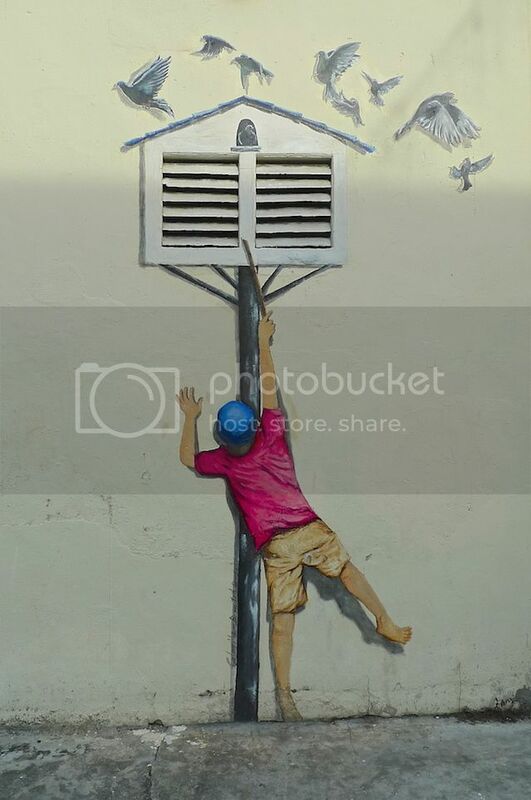 How clever of Zacharevic to paint the shadows as well - it made the boy appears real! This mural of a 'Little Girl In Blue' seemed a little frightening to me at first. Maybe because the girl was huge and she was looking down at me and she was not exactly smiling. LOL! Located on the wall of a building at Muntri Street, this mural depicts a girl lifting up herself with both hands on the windows. Again notice the girl has shadows? Zacharevic surely has a very good eye for details! When I was walking past this building along Armenian Street, I did not notice there was a mural there until someone pointed it out to me. The mural must had faded so much due to the wear and tear as a result of exposure to the weather. It was a mural of 'This Old Man' who is actually Uncle Ng, a clog maker who also happened to be the next door neighbour of the artist himself. There were a few more murals by Zacharevic which I did not manage to see. You can see the complete list at Timothy Tye's excellent Penang guide website. And if you like to do a lot of walking like me, you may want to check out his walking trail guide that leads to all of Ernest Zacharevich's murals in George Town! Note : All the above murals have no names. I borrowed the names from Timothy Tye who had named them on his website for easy recognition. With Zacharevic leading the way, a number of local artists had followed in his footsteps and painted a few murals in Penang. I stumbled upon this Giant Cat mural located on a wall at Armenian Street Ghaut. Also known as 'Skippy Comes To Penang', this Giant Cat mural is part of the 101 Lost Kittens project to create awareness of the need to protect animals and foster a love for pets. I was so busy taking picture of this cat that I did not notice a Giant Rat mural hiding around the corner! Check out a photo of the Giant Cat and the Giant Rat eyeing each other HERE. 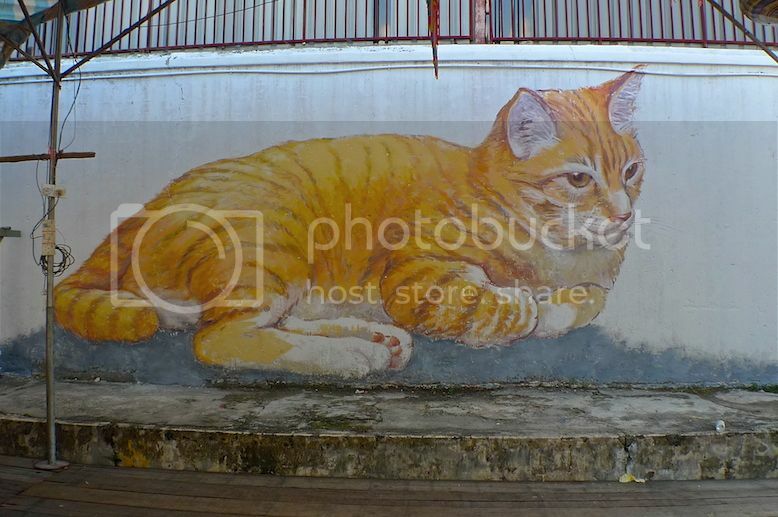 Take note that the paint used to draw this Giant Cat can only lasts 2 years so make sure you visit George Town and capture a photo of this mural now before it is gone forever! 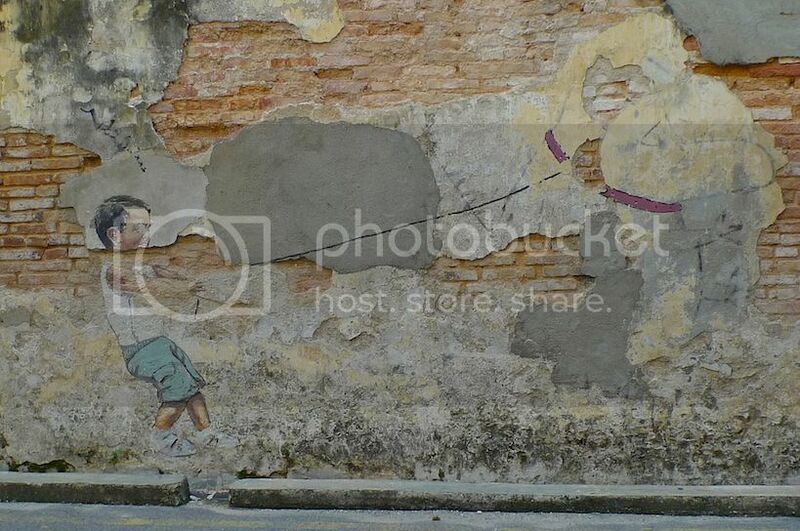 There's a mural very near to Hotel Sentral where I stayed on my first day in Penang. In fact, it's just opposite the hotel along the same road, which is Lorong Kinta. This mural depicts a Nyonya maiden receiving by basket a meal of noodles from a hawker on the street below. As this recalls the life in George Town in the early 20's, it is known as 'Nostalgic Meal Order' mural. It was painted by a local deaf-mute self taught artist Louis Gan, whose 'Brother and Sister On A Swing' mural had been particularly impressive. Check it out HERE. Thanks to Penang food blogger Ken who brought me around to taste yummy authentic Penang food, I managed to see two more murals. I probably would not have stumbled upon these murals if I had walked around on foot! This one is 'Pigeon Boy' mural located at Nagor Road. 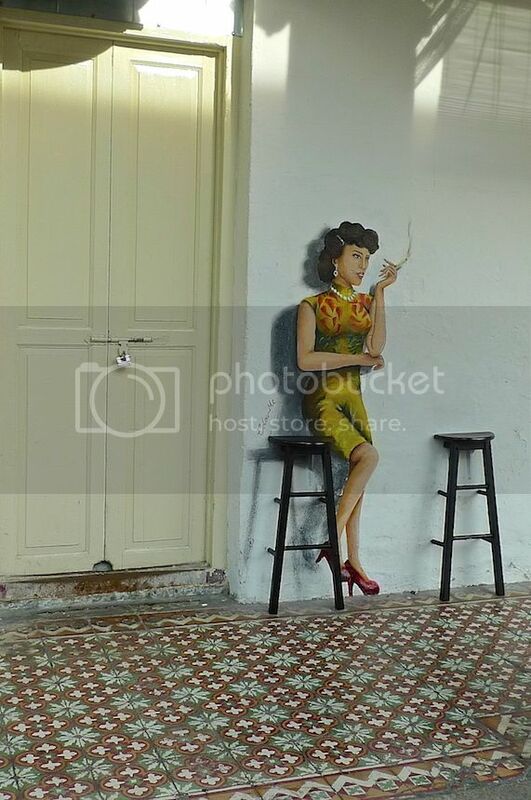 Nearby along the same road, there is this 'Shanghai Lady' mural. Notice that those chairs are real. 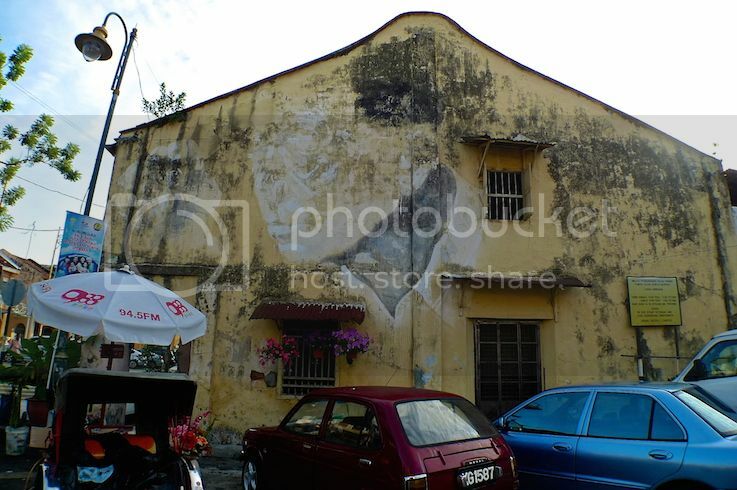 There are many murals waiting to be discovered in George Town and other parts of Penang. 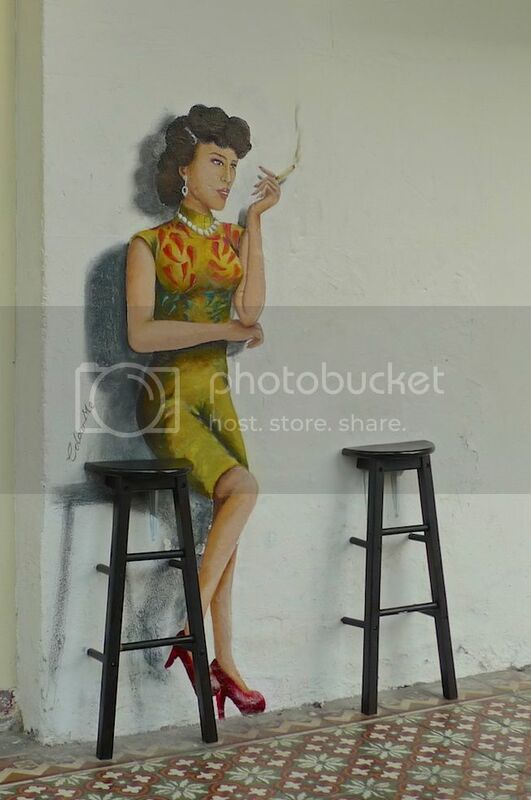 The murals have definitely made Penang more interesting to tourists and visitors. 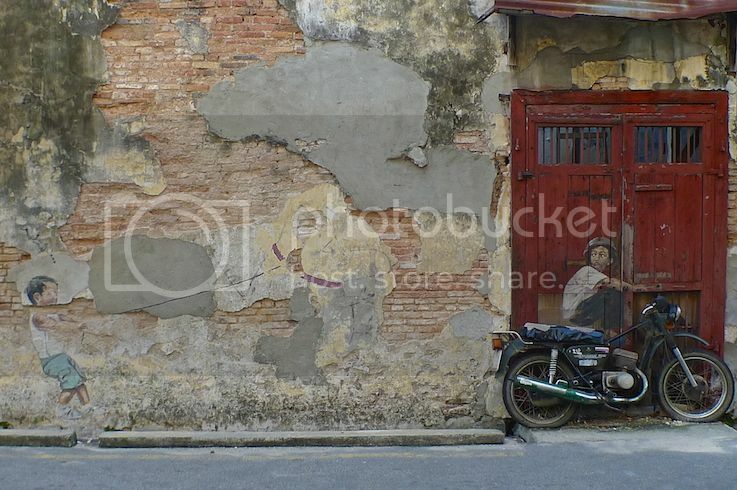 Old shophouses and streets were made alive again with these murals. Many people have posed in front of these murals and took really funny shots of themselves! As I am a private person and prefer not to show my face online, you won't see me posing anytime soon. LOL! 1. Do your research first before you go and map out the location of all the murals that exist. 2. Start out early (about 8am) as it may get too hot in the afternoon. Evening time after 4pm is OK too. 3. Walking is the best way to check out all the murals. Or you may rent a bicycle. Alternatively, you can ride a trishaw with the trishaw rider as your guide. Driving a car is not advisable as you need to look for parking and you might miss a lot of interesting places along the way. 4. Make sure you put on sunblock and wear a hat, and bring drinking water with you. 5. Wear lose clothing and comfortable walking shoes. 6. Depending on how many murals you plan to visit, the whole trip may take 3 hours or more. 7. Lastly, enjoy the murals, don't forget to take pictures (and pose if you like) and NEVER EVER vandalise the murals!